Chief rabbi of France; grandson, on his mother's side, of Hirsch Katzenellenbogen, chief rabbi of Upper Alsace; born at Lixheim, Lorraine, July 13, 1813; died at Montmorency 1888. At the age of fourteen he entered the rabbinical school at Metz, which two years later became the Ecole Centrale Rabbinique of France, under government control. 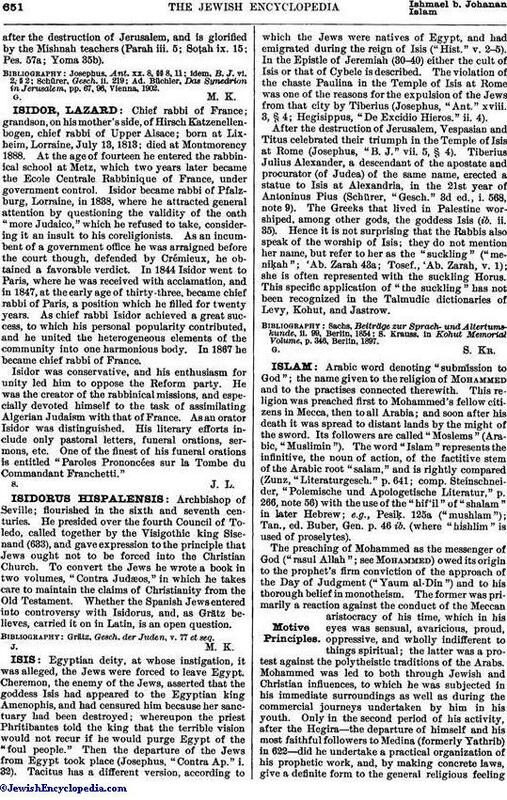 Isidor became rabbi of Pfalzburg, Lorraine, in 1838, where he attracted general attention by questioning the validity of the oath "more Judaico," which he refused to take, considering it an insult to his coreligionists. As an incumbent of a government office he was arraigned before the court though, defended by Crémieux, he obtained a favorable verdict. In 1844 Isidor went to Paris, where he was received with acclamation, and in 1847, at the early age of thirty-three, became chief rabbi of Paris, a position which he filled for twenty years. As chief rabbi Isidor achieved a great success, to which his personal popularity contributed, and he united the heterogeneous elements of the community into one harmonious body. In 1867 he became chief rabbi of France. Isidor was conservative, and his enthusiasm for unity led him to oppose the Reform party. He was the creator of the rabbinical missions, and especially devoted himself to the task of assimilating Algerian Judaism with that of France. As an orator Isidor was distinguished. His literary efforts include only pastoral letters, funeral orations, sermons, etc. One of the finest of his funeral orations is entitled "Paroles Prononcées sur la Tombe du Commandant Franchetti."